Mix all the spices except for the olive oil. Rub the olive oil all over the chicken and then season the chicken with the spices, not forgetting the crevice. Now stand the chicken on an empty juice or soda can. Place the chicken in a baking sheet that has a little water in it..Just keep in mind when placing the chicken in a baking sheet, the chicken shouldn’t touch the water. The water is to help reduce smoke coming out of the oven produced by the chicken drippings when it’s cooking. Then bake in a 450 degree oven until you get a crispy crust on the chicken, then reduce the oven to 200 degrees and cover the chicken with aluminium foil and continue cooking until the chicken is done.. When the chicken is done, remove from the oven and take out the juice can.. 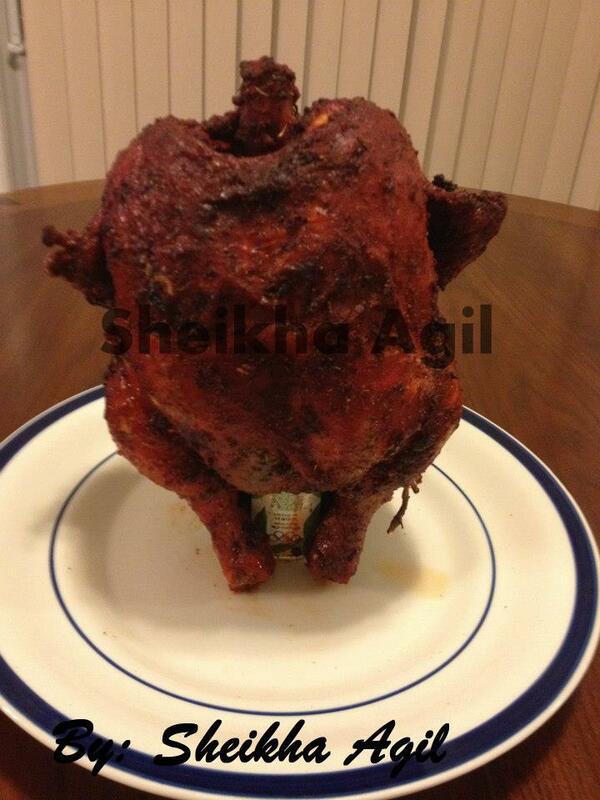 The chicken is ready to be served..Enjoy! !